Outside one of the towering structures making up the Tate Modern in London, as seen back in May. 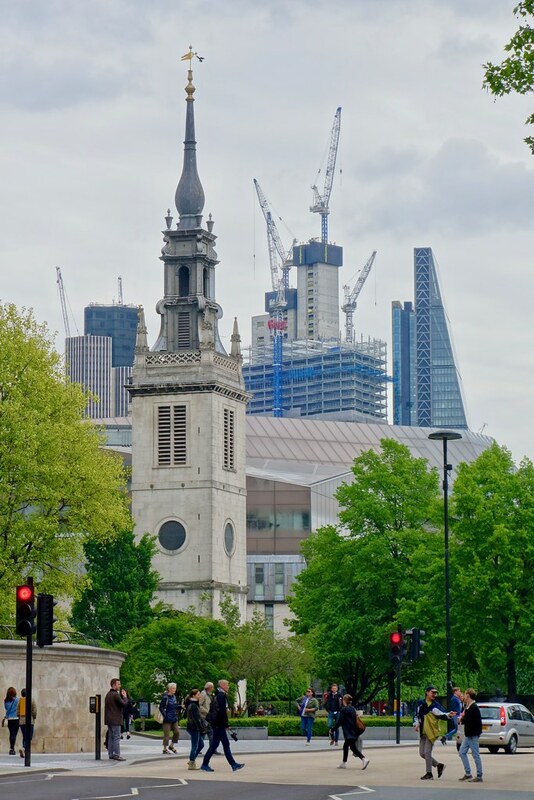 On my three visits to London over the last decade, I’ve always been amazed at the number of cranes in the skyline. It was no different on my last visit there back in May. Duchess of Cambridge, England, London, Prince William, random, royal family, souvenir, Travel, U.K.
Poor William and Kate! 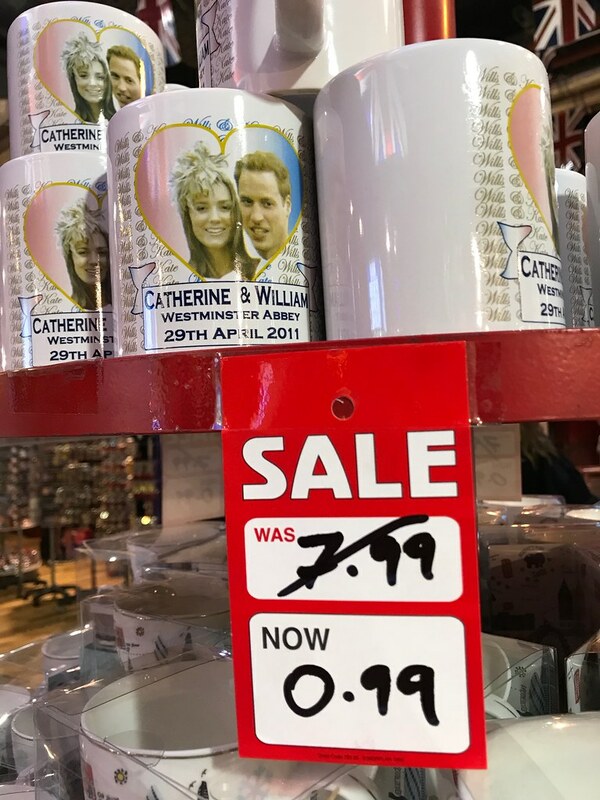 I burst out laughing when I came across this heavy price cut at a souvenir shop in London in May, not long after Prince Harry and Meghan Markle tied the knot. 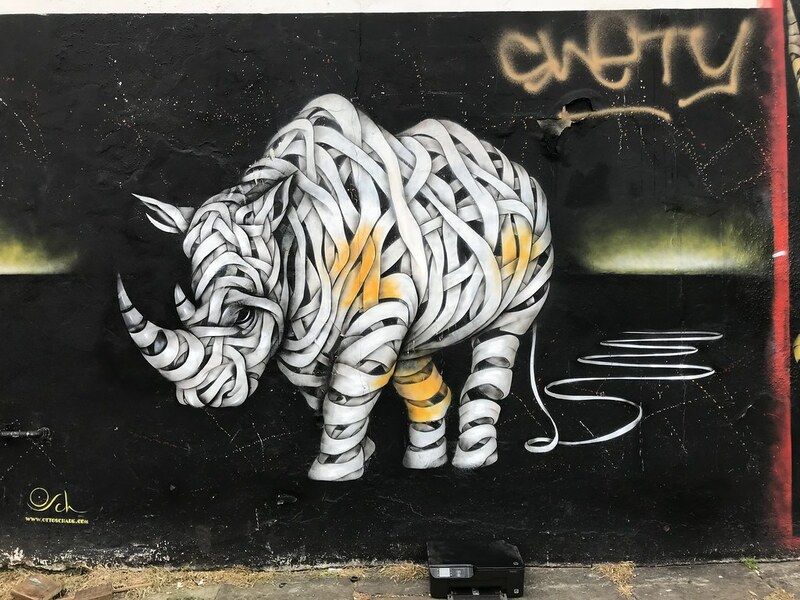 Another beautiful mural in the neighbourhood surrounding Camden Market in London. Spotted on my visit to the British capital back in May. 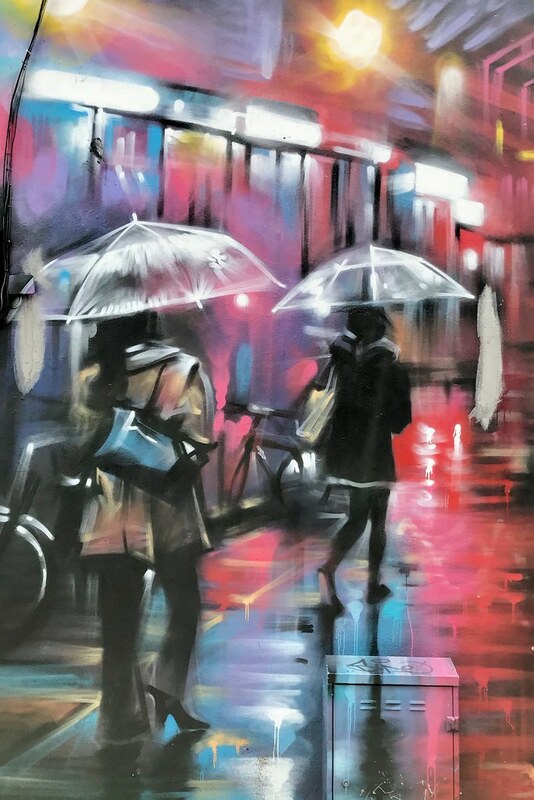 One of the many pieces of street art found in the area around Camden Lock, London, snapped on my visit back in May. The word sandbox can mean different things to different people. For some, it might evoke a play area inhabited with children and their toys, fuelling young imaginations as they shape and reshape the sand to create an evolving imaginary world. For other, it’s simply a technical term to describe a virtual place for safe technological experimentation. 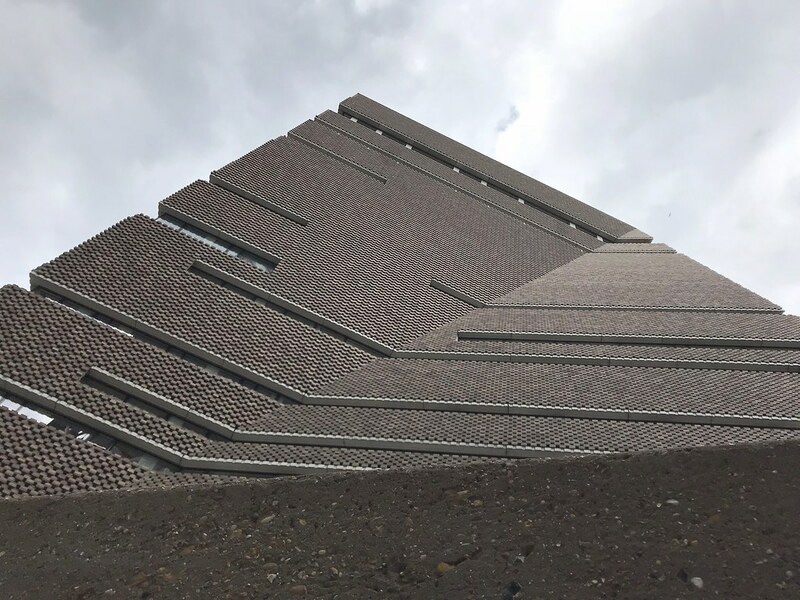 The V&A Museum in London melds those concepts with an exhibition called The Future Starts Here, which runs until Nov. 4. 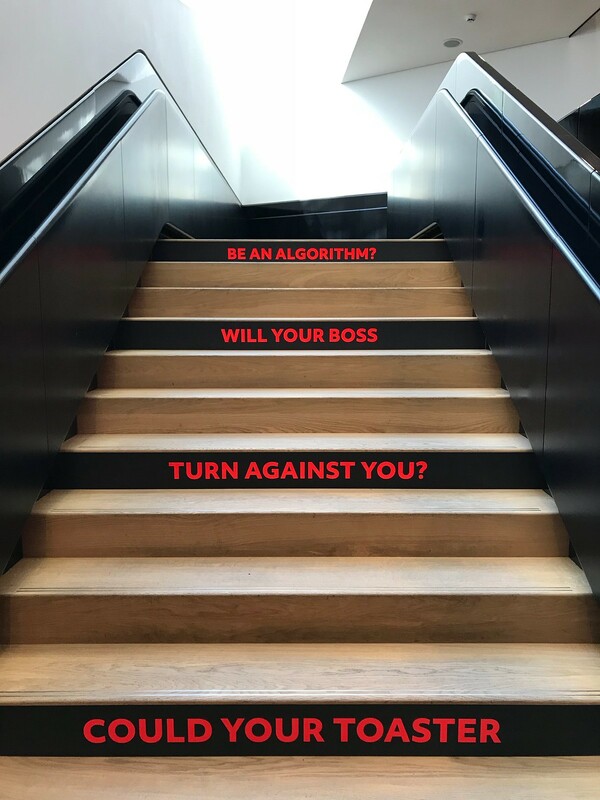 The multi- and inter-disciplinary installation, which I visited as part of a personal vacation this spring, is best described as a quick survey course on futurism, with an emphasis on humans’ role in fashioning the world of tomorrow and how we all might fit in such a place — should we fit in at all. 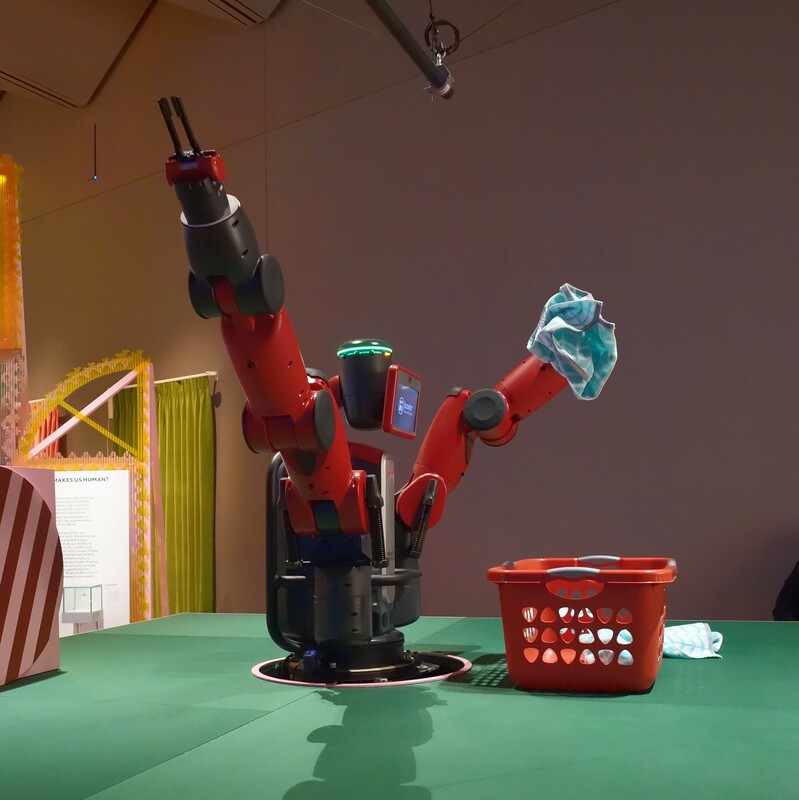 As visitors descend into a vast space in the bowels of the museum, they are greeted by a laundry robot (photo above) — the first of a chain of thought-provoking displays tackling our present and the future in relation to science and technology, climate change and environment, politics and philosophy, urbanism and more. 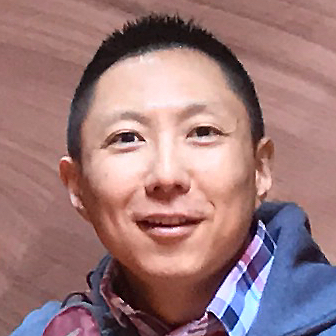 The introductory focus on home automation and other types of high-tech convenience quickly gives way to weightier subjects, including the effect of technology on care for seniors. 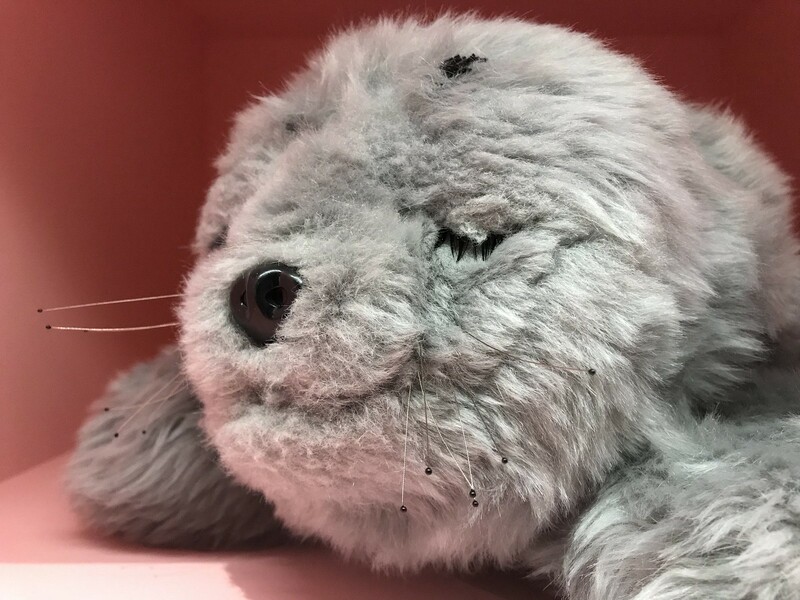 A sign next to a cuddly robotic therapy seal (photo below) asks viewers to evaluate if such devices are simply helpful tools or if they are the first step in the outsourcing of companionship. Farther along, visitors get to peer into the mind of a teenaged aspiring architect (photo above) as he conjures up an ideal for his home city, war-ravaged Aleppo, Syria. 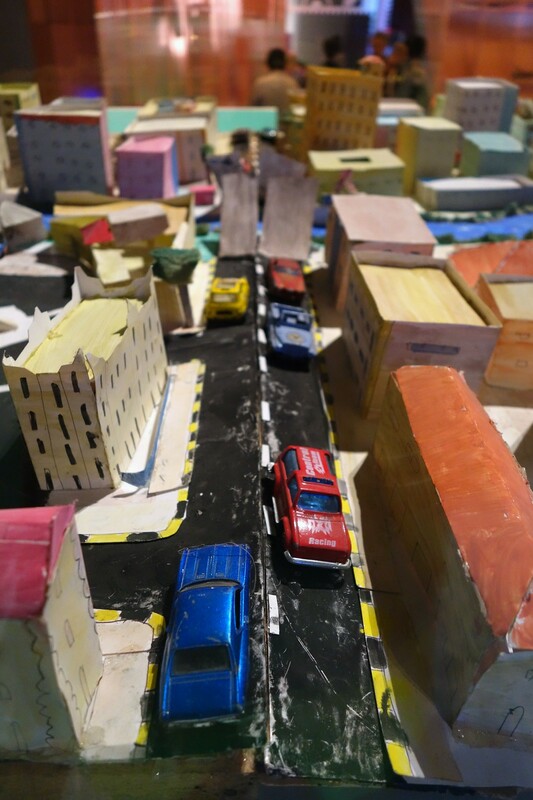 His Aleppo, according to the card describing the display, would have integrated public green spaces, top-notch public transportation and buildings fuelled by sunlight — and when he grows up, he wants to help bring such a city to life. What if humans truly mess up and permanently wreck this fragile blue marble suspended in space we call home? 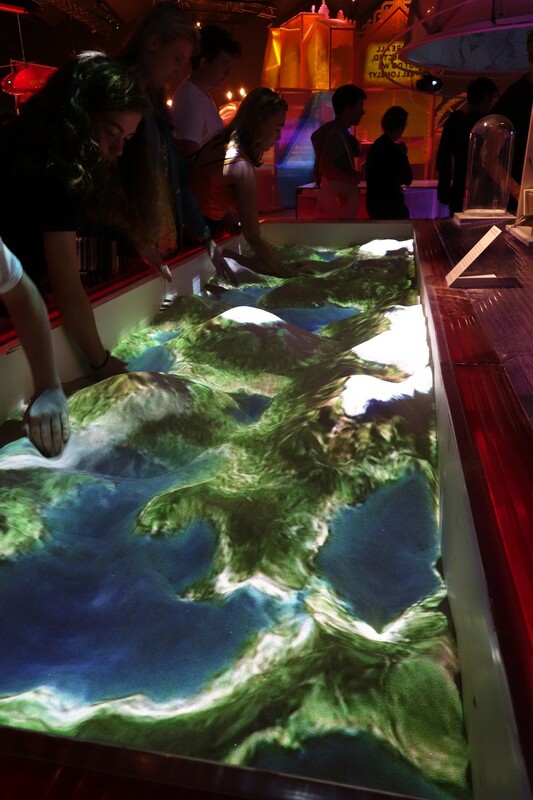 That’s where the sandbox (first photo in this post) comes in, asking us to participate in a virtual terraforming exercise. Dig deep and create a vast sea; pile up the sand and watch snow caps form. If only things were so simple in real life. A few steps away is a prototype showing an artificial leaf capable of photosynthesis, just like its natural counterpart, offered as a possible aid to slow climate change. And around the corner from this is a brief examination of space exploration and the ongoing hunt for a new galactic foothold for Homo sapiens. As visitors wend their way through the displays, they are also asked to consider the impact of technology on democracy, energy consumption/extraction and the accumulation/dissemination of knowledge. The myriad questions posed by the presentations are left to linger as you leave — and how to answer them is, of course, left to you. 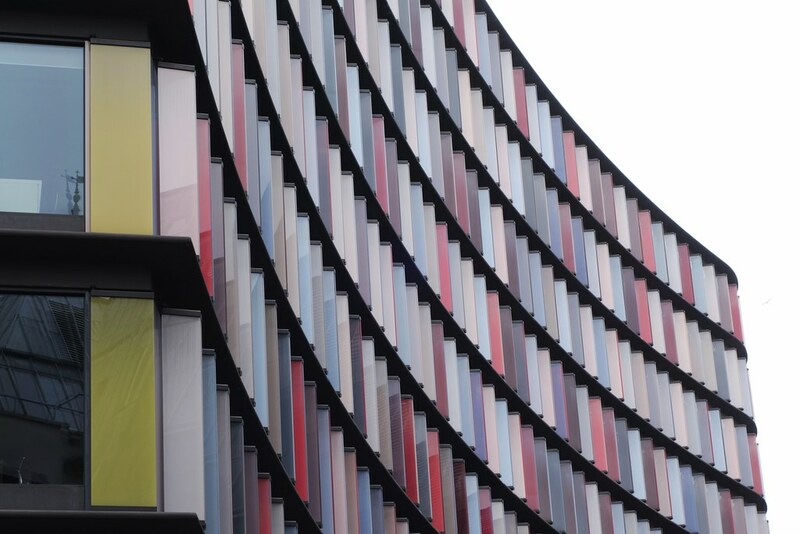 Here’s an office tower with a very funky frontage, just around the corner from St. Paul’s Cathedral in London. Spotted on my visit there a few months ago. England, First World War, history, Imperial War Museum, London, military, photography, photowalk, Travel, U.K. 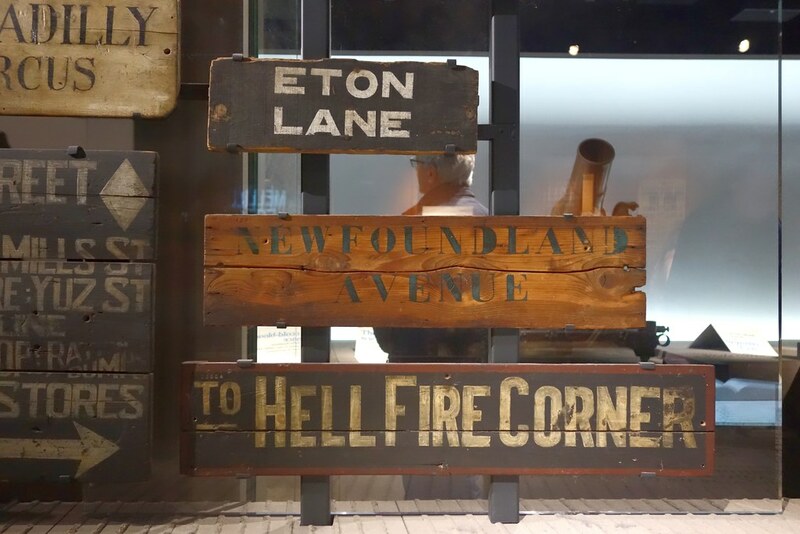 These signs, recovered in the aftermath of the First World War and now displayed at the Imperial War Museum in London, helped soldiers navigate the maze of trenches on the front lines. 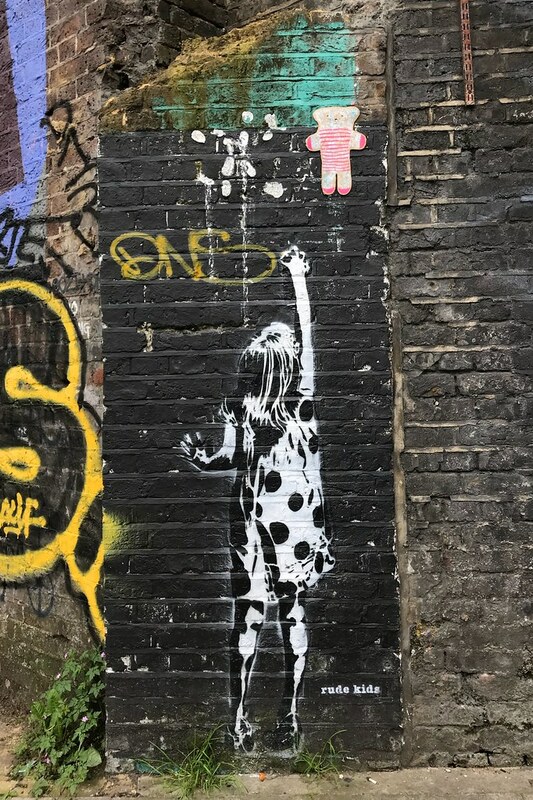 Another example of the cool street art in Camden Town, London. 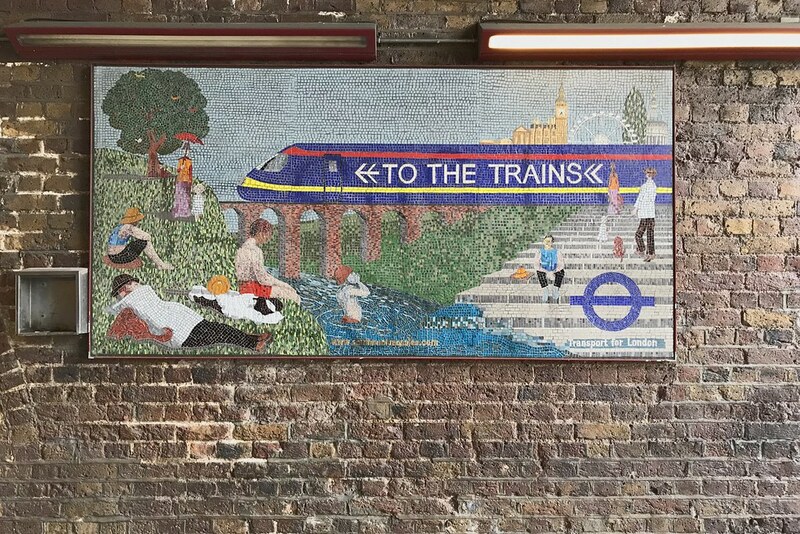 A cool mosaic in a pedestrian passage on the grounds of Waterloo station on the south bank of the Thames in London.